I did as much research as I could before my trip to Spain without having a book. My mountain project stalking pointed to a climb called Via Valencianos, which was on the Penon D'Fache near Calpe, 10 pitches, and bolted in the hard parts but not enough to shake the trad classification. I had my heart set on this route leading up to the trip. I did what I would call training to prepare for it, but I didn't have a feel for anything like the density of the climbing in this area, just how much a feature like this begged to be climbed, or even how close it was to anything else. Knowing nothing else, I had loose plans to somehow travel to Calpe, climb the Via Valencianos, and get back to Finnestrat. I suppose I decided I would figure it out when I got there. We asked about Via Valencianos when we got to the hostel. Apparently people start avoiding a climb in Spain when it gets so popular that it ends up on the predominantly american frequented Mountain Project. (They prefer summit post) Limestone gets slick fast. Too many smears and you might as well chip the rock off and turn it into a luxury kitchen counter top. 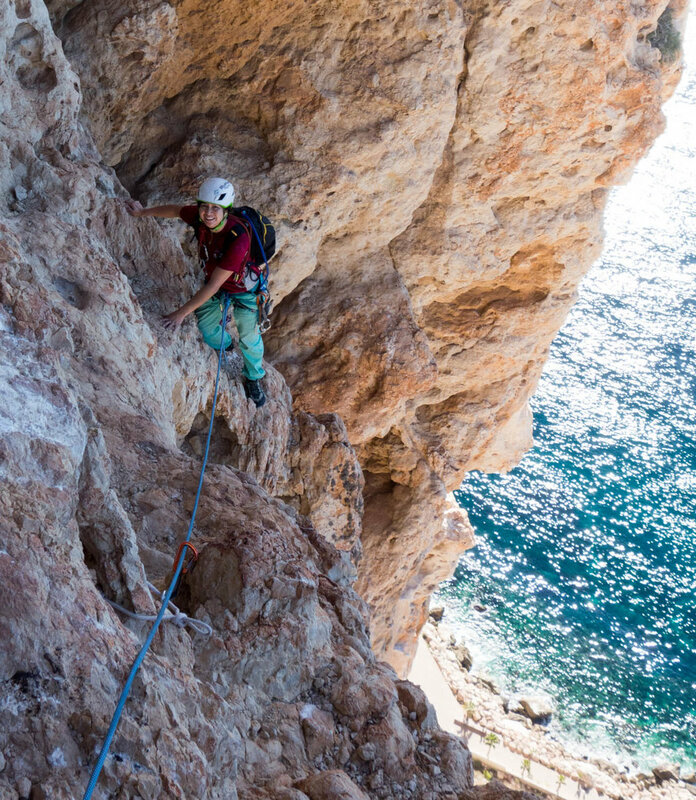 I experienced slippery limestone anecdotally so I took their advice and headed to the second most popular route on the Penon, Diedo UBSA. Summit post describes the climb as superb 10 pitch dihedral on the south face, with the 5+ rating. That’s a 5.10a to the YDS peeps out there. We were climbing hard at 6a-6c the whole trip so we didn’t bat an eye when the multipitch suggested to us was rated a 5+. The rating system distracted us from our original grading biases, and we realized not long afterward that this route was the hardest and longest multipitch we have ever climbed. Normally 10 pitches would take us 10 hours. Some of the guides called it a Grade IV climb. The highest commitment level I've climbed up until that point was a III, and that was the alpine East Buttress of Mount Whitney. That’s not a deal breaker but we thought that we had to start early if we didn’t want to descend in the dark. It was a grade IV after all. We got there around 5am, parking close to the pier while making extra sure that we hid all of my additional gear in our car since the book told us to be on high alert for break ins. We approached the Penon and were able to rope up right at sunrise. We had a full rack of cams, a rack of nuts, a single 60m rope, and a multipitch pack that contained water and snacks for the follower to carry. One of the incredible parts of this climb and climbing in Spain in general was how close the climbing was to the water. The sensation of climbing on the beach is unreal. We weren’t even 3 pitches up before the shoreline looked like google maps. This was a world away from the slabby granite we climb at home over meadows and valleys. I was surprised how many bolts there were during my leads. I slung a few holes and chickenheads but there weren’t cracks to place cams like I was used to. I placed maybe one or two pieces of gear for every pitch I led. We brought two racks of cams abroad but were smart enough to bring only a single rack on the climb. The trad in Spain was nothing like the trad we were used to at home. Me following. There are bolts everywhere you want them. The hardest pitch was Robin's lead. It was a series of pockets that were spread apart and hard to protect. The wall was very steep, and a little positive to boot. There was a 20 foot section that was unprotectable, there was an irresistible hole in wall big enough to crouch in where you could take a break from the forearm pumpfest. There was a note in the guide saying to avoid the temptation to bail into it, because the movement to get out of the hole was quite spicy. Robin could not resist the temptation. He placed a sling on the outside of the hole so I had to bail into the hole as well just to retrieve our protection. Peering out of the small, man size hole in an otherwise flat ediface was the most surreal experience. It felt like hanging out of a window of a 10 story building. Reaching out of the hole and getting back onto the face was one of the most exposed moves I’ve ever had to do in my life. Sure I was on toprope. I think that move would have been too spicy for me to do on lead. Of course, its easy to scare yourself on top rope. 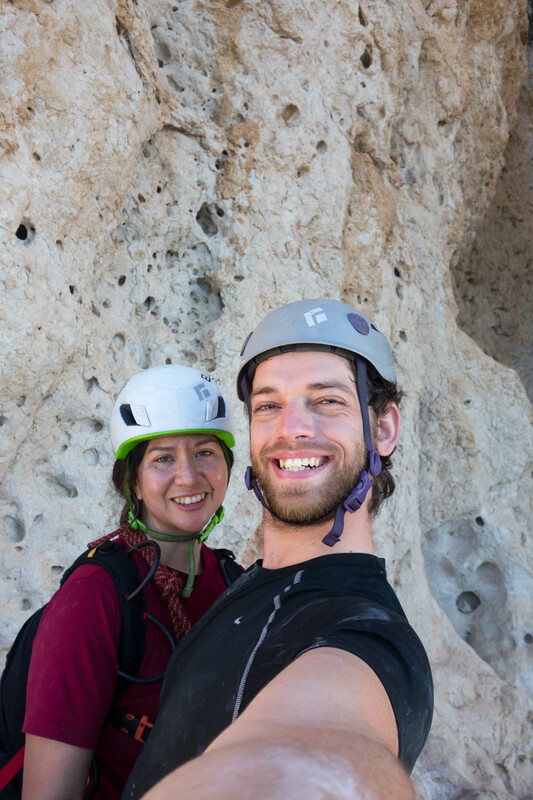 That exhilarating feeling is hard to beat when you are playing it safe, and we were climbing at our limit on a multipitch in a foreign country. My mind was racing. Shortly after that we had to do a rappel a single pitch to a spot about 60 feet below us and 30 feet to the climbers left to reach the next anchors on another portion of the climb. The topo told us to do it and I can see why. It was either that or a slick blank slab of a traverse about 100 feet across. I have never had to untie in the middle of a multipitch before. It was terrifying. In the moment, I identified it as a high risk situation and communicated that. If we lost the rope, we would be dead. It would be easy to lose the rope because neither of us were tied into it. We could also have rappelled off the end of our rope and fallen 500 feet to the ground. It had to be a pretty slow rappel because we had to walk ourselves over to the next section 30 feet away opposed to rappelling straight down. I’m making it sound like this was hard to do, which it wasn’t, it was just particularly dangerous. As someone who does a lot of dangerous looking things, I think I can assert that this was actually dangerous. Perhaps this underlines how safe climbing actually is, because something as seemingly innocuous as rappelling is the thing that would have ended our lives on that trip. Robin went first. We were careful to tie knots to the end of the rope. He rappelled safely and slowly to a ledge, where he anchored into some bolts. He yelled, “off rappel” and let go of the rope so that it would swing back to me. He started to build another anchor where he stood. I was feeling a little but uneasy about the situation, so I set up an autoblock, (an extra strand attached at an extra point that will bind into the rappel device if I let go), unhooked my personal anchor system (PAS), and rappelled down myself. I got to Robin, and clipped my PAS into his anchor. Now, this next part is what keeps me up at night. I unhooked my rappel device, pulled the rope off, and let it go. I felt the weight of the rope pull against the autoblock on my leg as the rope struggled to be parallel under the rappel bolts 30 feet away. I almost lost the rope. If I hadn’t set up an autoblock (which I don’t do 99% of the time), I would have lost the rope. It was a close one. I felt a rush of emotion as soon as I felt that tug on my leg. I didn’t tell Robin until long after the climb was done, maybe not until the flight home, but that scared the be-jesus out of me. I am not going to say that’s the closest call I’ve ever had while climbing, but its one I would have directly caused due to carelessness. There was a little bit more traversing and some not ideal slab pulling and corner climbing, but we made to the top in record time. 10 pitches and we were done in time for lunch. It only took us 4.5 hours, even with the rappel. The views from the top were gorgeous, and the descent was along an established tourists trail that led to the top of the mountain. The limestone was slick on the way down because of the well trod path, but would be an excellent trail for people wanting to see the beautiful views without the supreme climbing. Hat Hair but we are done with the climb and incredibly happy with our accomplishment. By noon we were enjoying lunch at a sit down restaurant near our car with a view of the Penon. Of all the climbs we got on in Spain, this one was the most beautiful and the most satisfying. It aligns most with all of our current goals and will always be the benchmark route for how incredible a route is. I tell all my friends that I could spend my life climbing in Spain, but if I did that, I'd spend at least the first 3 months attempting all the routes on the Penon. 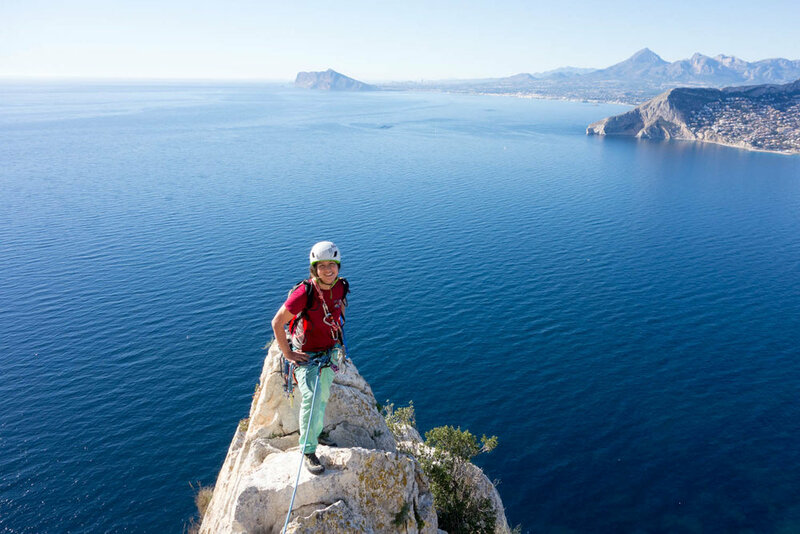 Have you climbed the Penon D'fache? How did it go?! Let me know in the comments.